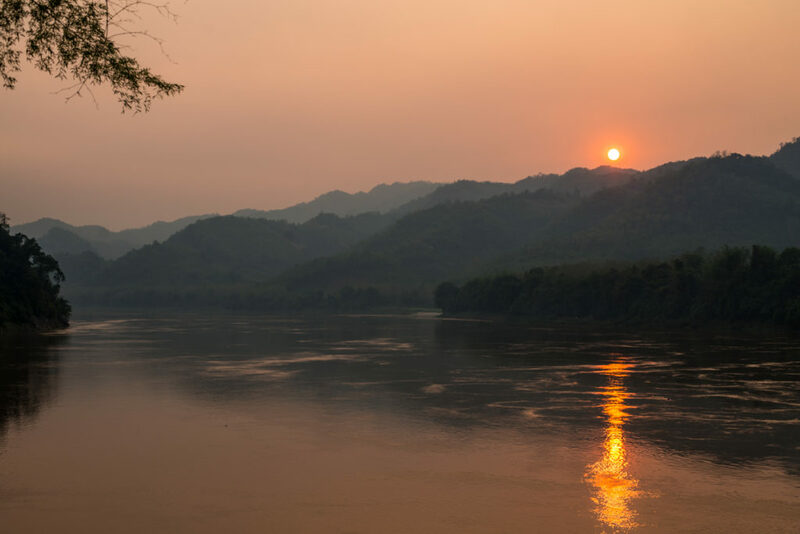 Luang Prabang, in Laos, is one of the most beautiful and interesting cities in Southern Asia. 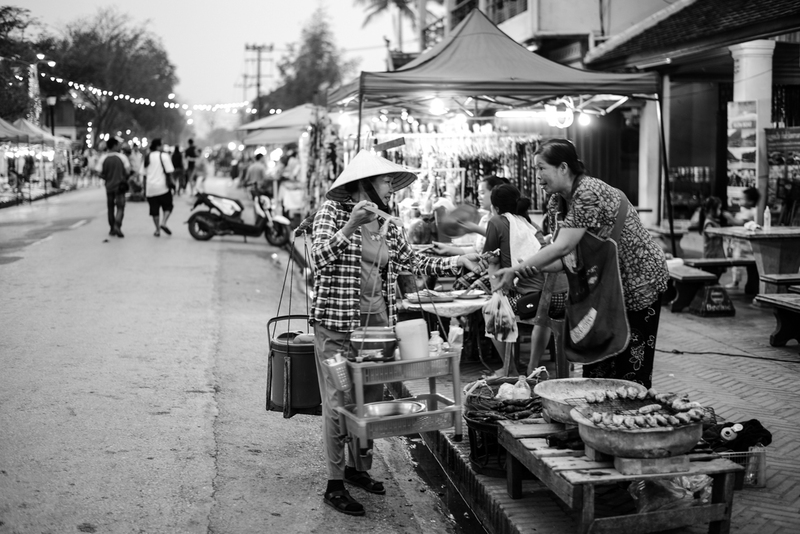 It has amazing temples, a nice architecture and a couple of interesting markets that make the city a place you just can’t miss. 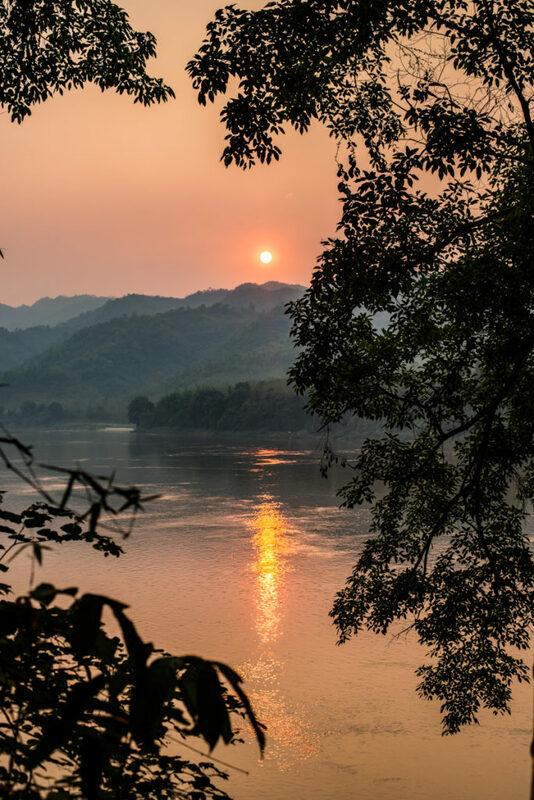 Mekong river goes along the edge of the city as an inseparable companion and it adds a romantic touch to this place. When I went to Luang Prabang, the New year festival (Nang Sangkhan) was taking place (check my video about the festival). During the festival locals and foreigns enjoy parting together, drinking together, throwing water each other and having a lot of fun in the streets of the city. 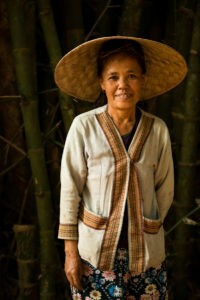 I also spent some days at Mekong Eden Farm, a project linked to permaculture and organic farming led by Om Phonepasith. Om picked a good friend of mine and myself in one of the several quays of Luang Prabang and he brought us to his little paradise by boat through the Mekong river. When we arrived to the Farm we immediately understood why “Eden” is part of the name of the place. It’s a beautiful place with big trees, shrubs and plants of different shapes and colours. 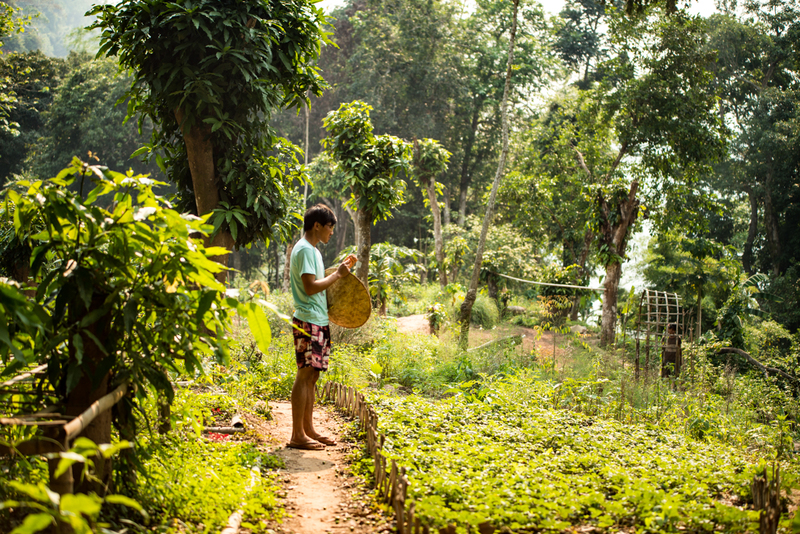 The first part accessible through bamboo stairs starting at the river is where the kitchen and the accommodation for the team and the volunteers are located together with a small path that lead to the gardens. 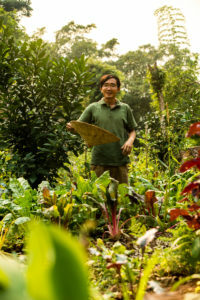 The very well maintained gardens are overflowing with veggies, flowers and insects that leaves you with your mouth open. 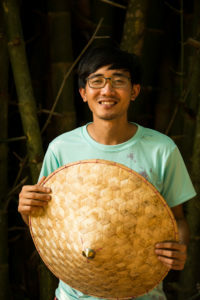 Om applies a series of techniques based on ecological agriculture. This includes the observation of processes and behaviours in nature, taking care of the soil, avoiding monocultures, increasing the biodiversity and searching for symbiosis. 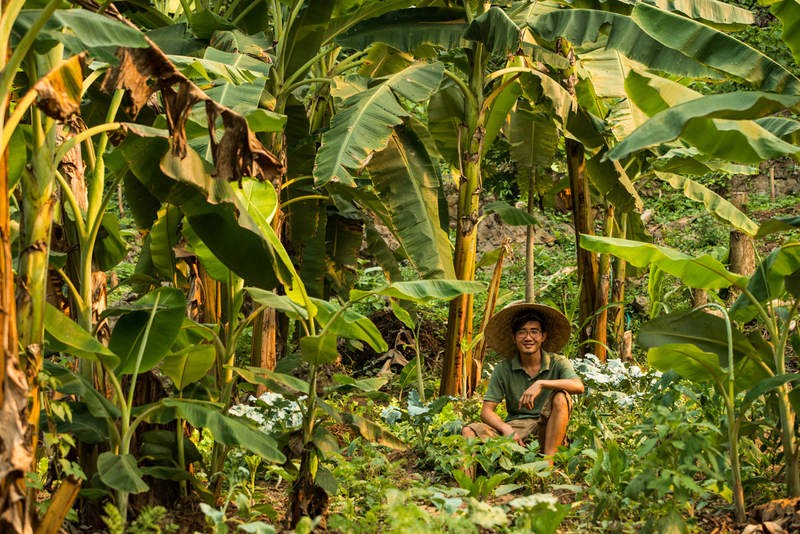 He bought that piece of land some years ago and he leveraged his skills and knowledge to create an efficient farm that has become a reference in the organic agriculture in Laos and Southern Asia. All the elements that make part of his gardens have a specific role and they efficiently contribute to the whole system designed by him. 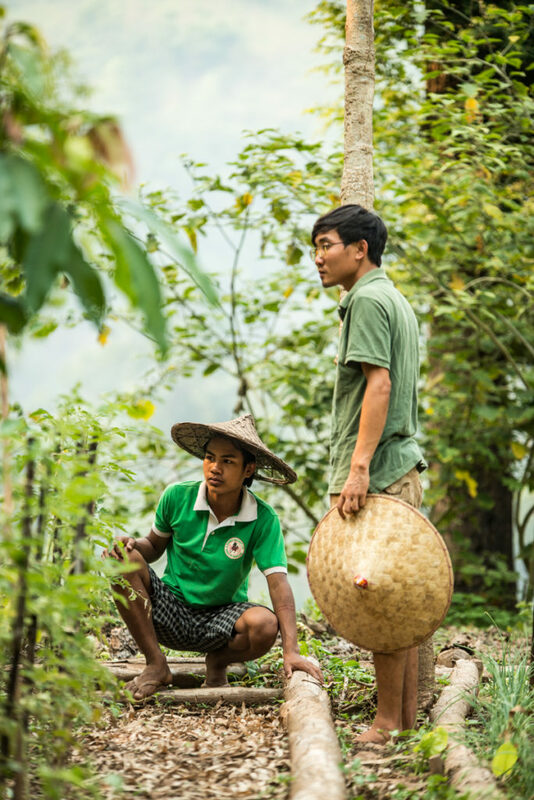 The plants are carefully selected and planted to get beneficial relationships between them. 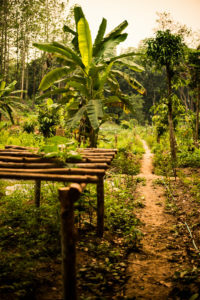 The technique of growing different plants in the same space is called intercropping. A plant A can help another plant B to get some nutrients that the plant B cannot get by itself easily. A plant can get advantage of another plant as support. I remember the pepper plant climbing the trunk of the jack fruit tree in Vietnam at Phuoc’s place. 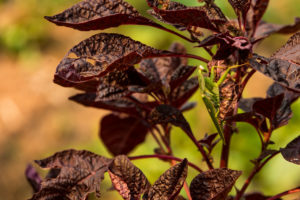 The best example is the winter plants that can be growth during summer time with the help of other plants that give shade and create the good conditions. This happens with the winter salad and the maze or sunflowers for instance. Some plants attract certain insects and other plants are not attractive at all for them. That’s the case of the tomato and the asparagus. The asparagus protects the tomato and the tomate makes the same with the asparagus. When we apply intercropping, the available space for weeds is reduced dramatically ( less available space, less light and more competition). 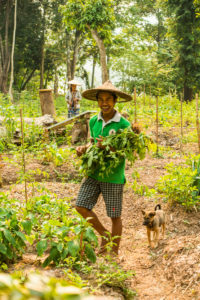 To enhance the soil, Om uses vermicompost. Vermicomposting is the use of specific worms (the most famous is the red wiggler, Eisenia fetida, the common earthworm cannot be used) to compost organic matter. These worms are photosensitive and they breath through the skin so it’s extremely important to avoid any light and keep moisture in the place where they are located. The worms eat organic matter in state of decomposition and this matter goes through their digestive system adding bacterias and interesting nutrients for plants. 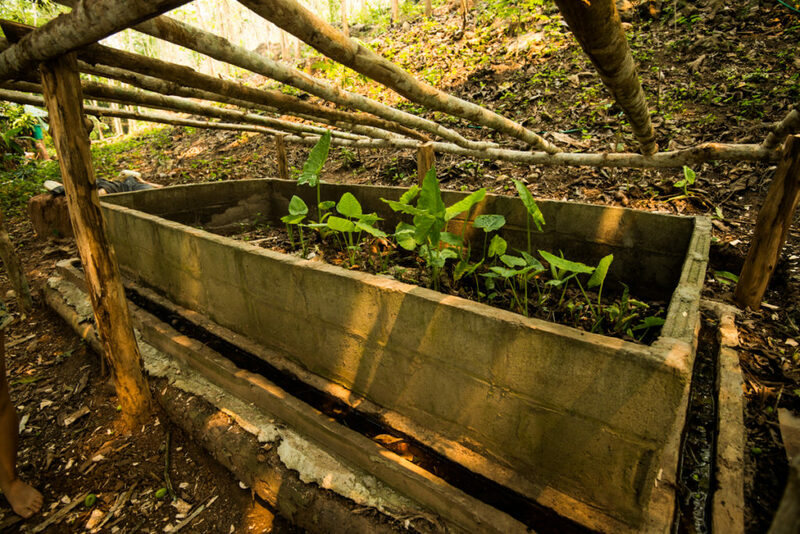 The process of vermicomposting also boosts the inmune system of the plants by helping them in creating antibiotics and narcotics to fight against pests and sicknesses. Another awesome advantage of having worms at home is that they love paper and cardboard. Hundred of toilet paper rolls have been devoured by them in my place! Yummy! I hope to write soon a post devoted to vermicomposting including much more details to those who want to discover this amazing world. Stay tuned! 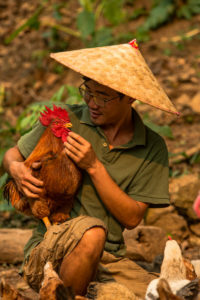 Om has also chickens as part of the ecological agriculture system. 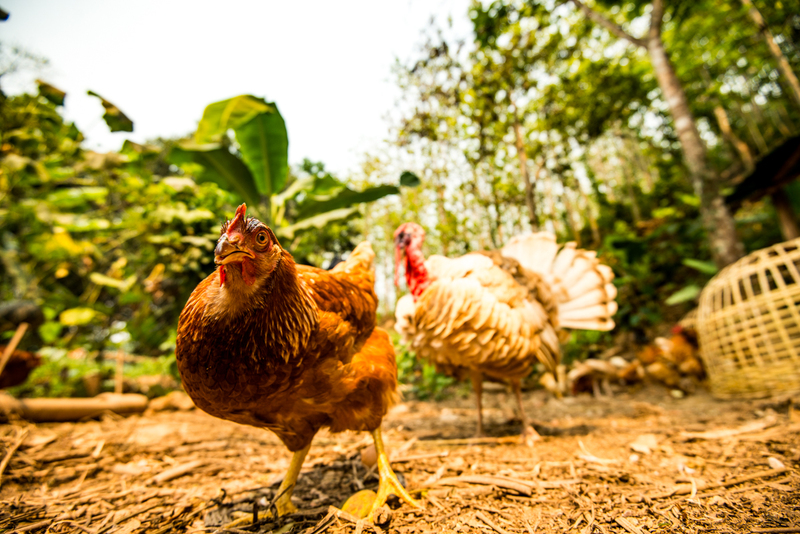 The chickens have many advantages, not only because they provide meat and eggs, but also because their manure is an excellent material to add in the compost and they are extremely efficient in cleaning up the gardens. 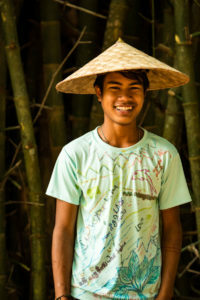 Om has launched a CSA (Community Supported Agriculture, where the community gets a basket every week with fresh veggies directly from the farmer) in Luang Prabang and he organises regular events inviting locals and foreigns to have fun and discover this amazing place on the edge of the Mekong river. Thanks Om for the invitation and for showing me your beautiful paradise where I spent so many nice moments! Special thanks to Tea who helped me with the video.